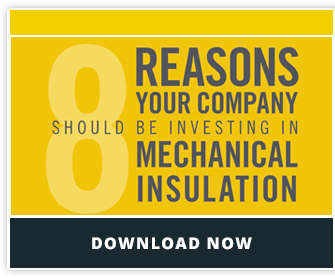 This point is especially relevant for existing facilities where the insulation needs to be repaired, replaced, upgraded, or installed for the first time. The right insulation contractor for this type of application should be able to perform an insulation energy audit before making any recommendations or proposals. Once the appraisal is complete, then the contractor can provide specific recommendations and estimates. Not only is this the most effective way to receive a complete picture of your facility’s true insulation needs, but it allows the mechanical insulation contractor to make the most effective recommendations possible. Design: Installing solutions that align with the design requirements of the project. Functionality: Designing systems that meet all functionality needs, including process control, personnel protection and efficiency. Budget: Working effectively within defined budgets and project scopes. Timeline: Adhering to a specified timeline and working to meet strict deadlines. Another important aspect of communication is the insulation contractor’s ability to work effectively with other trades. In any building project, the beginning of one phase is often dependent on the completion of another. This often requires the installers and technicians to work around each other or be somewhat flexible in their scheduling in order to complete the project correctly and on time. This ability to communicate with other contractors on the project is a major factor in success. Even when the insulation system has not been designed by the insulation contractor but rather specified elsewhere, the initial step for the insulation contractor is to read and understand the project specifications and drawings. Their expertise should go beyond simply installing product—the insulation contractor should be familiar with the objectives of the insulation job and be prepared to highlight and resolve any inconsistencies or errors in the specification. Code compliance is generally the responsibility of the design professional, but a knowledgeable insulation contractor should understand the code requirements in his or her area and be able to help expedite resolution of compliance issues.